Welcome back to Unit Study Fridays! Each week I get together with some great bloggers to bring unit study materials and resources based on the week’s theme. 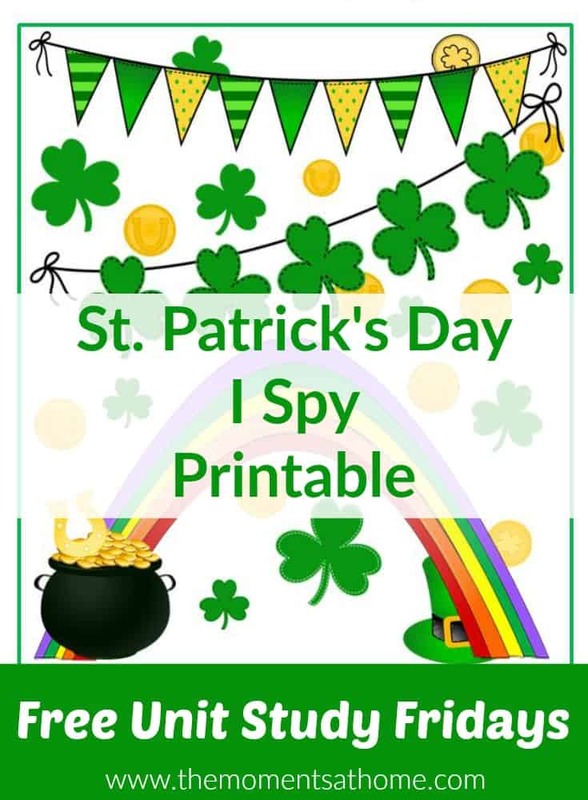 This week our theme is St. Patrick’s Day and I’m super excited to share an I spy St. Patrick’s day printable with you! Don’t forget to scroll down after this post for more St. Patrick’s day unit study resources. I know it’s a little early to think about St. Patrick’s Day so save this printable to Pinterest so you can find it easily when you’re ready to print. St. Patrick’s Day is a bit of an event at our house with the sneaky leprchaun leaving coins around the house for the kids to find. Sometimes the sneaky leprechaun sets out a few treats for the kids too. I enjoy making these little moments at home special for the kids. What kinds of things does your family do for St. Patricks day? Do you wear green so you don’t get pinched? How about a few more ideas to make the day stand out? Find the color green with your toddler or preschooler. Fill a basket with green objects you find around the house.